PARKING 3.5 ACRES, SIGN INCLUDED IN LEASE, 9 OFFICES ON MAIN FLOOR & MORE ON 2ND LEVEL, 5 & 10 YEAR LEASES AVAILABLE, 15 TON, 5 TON , 2000 LB AND 1000 LB CRANE INCLUDED IN LEASE, POSSIBLE 12000 SQ. FOOT WITH 2 OVERHEAD CRANES AVAILABLE FOR SEPARATE LEASE $6.00/ SQ. FT. NET LEASE, 2 ENTRANCES FOR PARKING AREA ONE ON YARMOUTH RD & ONE ON GAYLORD RD. 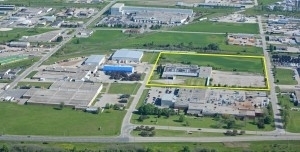 IMMEDIATE POSSESSION AVAILABLE, $3.50 SQ. FT. NEGOTIABLE ACCORDING TO SPACE LEASE.